This product from Chess Baron: New Design. Spiral-bound scorebook. 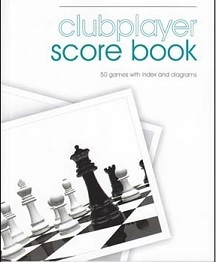 Holds 50 games with each game having room for 100 moves and one diagram, includes index of opponents. Available in 4 colours: blue, yellow, beige and gold. Measures: 8 1/2 inch x 5 1/2 inch (21.6 cm x 14cm).